c) a re-organization of the club Genderisms forging new connections with students from other schools in the world via classroom connections and other media, such as using our Facebook page : AC GENDERISMS (https://www.facebook.com/acgenderisms/ (run by my students). My current research is my teaching and my teaching is my current research as I navigate a world of having to carefully “name” a club, “explain myself” as a feminist teacher in Greece and negotiate delicate borders of understanding and acceptance in my classes. I think that without knowing I have been helping generate a generation/generations of generative feminism. My current research is my teaching and my teaching is my current research as I navigate a world of having to carefully “name” a club, “explain myself” as a feminist teacher in Greece and negotiate delicate borders of understanding and acceptance in my classes. I think that without knowing I have been helping generate a generation/generations of generative feminism. Since November 2014, I teach English Literature and language at Anatolia College high school, an International private school in Northern Greece. 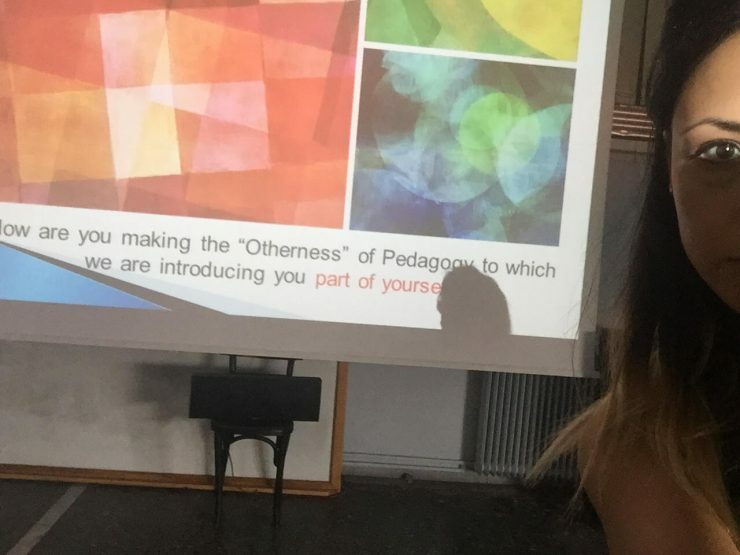 My pedagogic stance connects to my previous doctoral research and my feminist orientation vis-à-vis feminine creativity. Having explored a non-directive pedagogy at Higher Level Education during my PhD research I have been very keen to consider how such an approach might work at a secondary education level and what it might mean to facilitate discussions that shift students’ assumptions about their learning. I have found, both via my daily teaching experience and from student feedback, that ambiguity in providing answers at the age of 16 is not well-received. It makes teenagers much more uncomfortable than adults. On the other hand, it has been this very “faith” in ambiguity and enigmatic facilitation that helped initiate the beginnings of a club called “Genderisms” at Anatolia College. The club has ran for two years in an attempt to generate awareness about gender issues in multiple ways: research gender attitudes via questionnaires and interviews (student-led), educating students about sociological research methods and discussions/explorations of key texts in the feminist field. My teaching integrates and embodies the above approaches in one of the English Literature thematic units I have created. My contribution at the conference would be key in generating an impetus at my school and in Northern Greece to help me address this research more officially.